My first date with hypoliths! Girls EVA for the first time in MARS 160 mission! As halophile enthusiast, it was my first encounter with hypoliths. Anastasiya and I left no stone unturned as our objective for today’s EVA was to explore hypoliths in the vicinity of the MDRS habitat. This EVA was Anastasiya’s, who is the Crew Journalist of the MARS 160 mission, cross-training for field exploration of hypoliths. 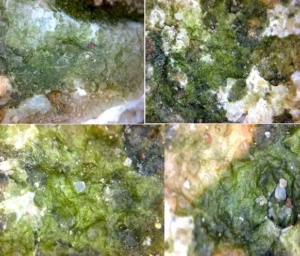 We found some amazing lush green photosynthetic organisms “resting” under the rocks!